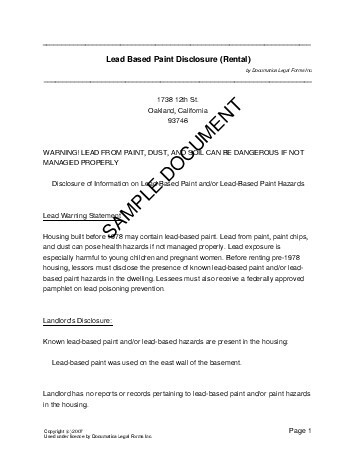 A Lead Paint Disclosure serves as a legal record of the presence and/or possible presence of lead-based paint hazards in a residential dwelling. It states whether there are any known hazards or records of hazards, and also documents that the purchaser has had the opportunity to inspect the premises. This document meets the requirements of the United States Residential Lead-Based Paint Hazard Reduction Act (1992) which requires disclosure of lead-based paint hazards on houses built prior to 1978 which are being sold or leased. Does the Seller(s) know of any lead or lead-based paint hazards on the property? Does the Landlord(s) know of any lead or lead-based paint hazards on the property? Has the Seller(s) given the Purchaser(s) all records/reports (if any) about lead and lead-based paint hazards on the property? Has the Landlord(s) given the Tenant(s) all records/reports (if any) about lead and lead-based paint hazards on the property? The Buyer(s) has the right to inspect the premises for lead/lead-based paint hazards, but may waive this right. Will the Buyer(s) be conducting a risk assessment or inspection for lead hazards? Was an agent involved in selling or renting the property? If you do not know the date, leave these fields blank. We strongly recommend obtaining an attorney reviewed Lead Paint Disclosure directly from us. Below are some random samples we have created with Documatica. Please note that these documents reflect a certain set of answers, and it is very likely that the document you require is different. Do not rely on the templates below - create your own customized Lead Paint Disclosure with our webpage. For maximum legal protection, obtain a lawyer reviewed Lead Paint Disclosure directly from us.